Please note: There is now the new r/WinSSHTerm on Reddit. Please post your feedback there. Thanks! I have been using winsshterm since october 2016 before that i was using mobaxterm product but now that i discover this product i switch to it 100%. The feature i was using in mobaxterm have been integrate by Patrick after talking with him about those. he implement them in a record time and they all work like a charm and he event make them more flexible then in mobaxterm product. Thanks a lot Patrick for all the good works and new features. Many thanks to you too, Stephane. You gave me new ideas and helped make WinSSHTerm better. 1) Add a function to kill all process (sessions) - When I have 4 or more sessions open and there is no easy way to get rid of all sessions. 3) Add a function to load scripts and able to send it to all sessions. 4) Add the ability to Import/Export Sessions in the File Menu. Thanks for your feedback. It would be great if you could use the contact form, so I can email you back and we can talk about your points. Release 1.9.0 will have support for shared connections, which can be loaded by multiple users and also exported. Thanks a lot for your great tool. Featurerequest for you: add please some stored password encryption, maybe with master-password like WinSCP do. Thanks, I'll think about your suggestion. For now, I recommend everyone who needs maximum security to use public key authentication in combination with Pageant. This way there is no need to store passwords. From release 1.9.0 on all passwords will be AES encrypted. The path to SSH keys + log file currently do not recognise Windows environment variables. e.g. %USERPROFILE%. If they did, then it would make sharing WinSSHTerm config with colleagues easier. Thanks, the shared connections file will support a limited set of template variables. You can use these to set custom paths, passwords, SSH users,... for each user. Tip: If you put your SSH keys somewhere inside your WinSSHTerm folder, only the relative path will be stored. "The first key-exchange algorithm supported by the server is diffie-hellman-group1-sha1, which is below the configured warning threshold. Do you want to continue with this connection?" "Server sent disconnect message type 2 (protocol error): 'Service is not known'"
I can connect fine using putty.exe alone, but not with WinSSHTerm.exe. I looked for the threshold setting but cannot find one. Any idea on how to get past this? Hello, could you try to connect to your switch using putty.exe, with X11 forwarding enabled (Connection->SSH->X11->Enable X11 forwarding) and see if you get the same error? Hi, yes, i get the exact same error when i enabled it in putty as you asked. I then opened Putty again, loaded the WinSSHTerm saved session, unchecked that option, and saved it. That seems to have fixed the issue. Thanks for leading me to the light. Thanks for your feedback. There will be an option to disable X11 forwarding in release 1.9.1. Copy & Paste is not Working, Is there any option to enable? 1. please make active tab more visible by changing background color. 2. is it possible that new tab appear on the left as a first tab? 3. currently the tabs are simple rectangle. Is it possible to change it into shapes more like firefox or . It is hard to distinguigsh the tab now. 4. Please make master password for all connections. 5. Is it possible to search text in the putty output? It would be great. - You can select an alternative tab layout by selecting the checkbox "Use dark tab layout" under File->Preferences->General. With this layout the active tab is easier to distinguish. - All passwords in the local connections and preferences file are encrypted with your personal key, which gets auto-generated on the first run of WinSSHTerm and which is separately stored in the config directory. This key has the same function as a master password - without it, you won't be able to decrypt the stored connection passwords. - Searching text in the PuTTY output is currently not possible. However, by right-clicking the tab and choosing "Copy All to Clipboard" you can copy the current PuTTY output to clipboard and then paste it to a text editor like e.g. notepad++ and do the search there. Regarding master password, I would like avoid situation when someone opens the program on my computer without my knowlegde. Currently all connecions are accessible. Master password is in file and anyone can connect to the servers. PuttyConnectionManager had such a feature. Thanks again for your feedback. Generally it is not recommended to use WinSSHTerm on a computer you don't trust. And also it would be better to use public key authentication (with an encrypted private key) in combination with Pageant instead of passwords. That way it would not be necessary to store passwords, and without the passphrase of your private key no other user on your computer could connect to your servers. However, I think it would be worth to add an option to encrypt the key file with a password. I'll add this feature in the next release (probably 1.10.1). That's great! I am looking forward to test it. Someone in the comments wrote about Quick Connection Toolbar, I would vote for it also. But I do it by adding dummy connection in a tree. I would like to have connections tree on the rigth. Thanks for your feedback. Yes, currently the connection and config window can't be docked to the right side. Is there a special reason why you would like it on the right side? I have only one monitor. Typically I have WinSSHTerm in the background and notepad with reference commands in the front. When I copy commands I cannot see enough right output in winsshterm unless I close session/config panel. Ok, so for your workflow it would be better to have it on the right side. I'll add an option to dock the connection and config window to the right side in the next release. a nice little tool you created here. It has almost all I need. What I am really missing is setting my own colors. Would you consider this is a valid enhancement request? Great app. Would you be able to add a sort function to the tree to sort alphabetically? Great app, tried version 1.11.2 but was unable to use stored passwords to login to Debian Linux with SSH. Switched back to 1.10.1 (which i used before) and was able to autologin with saved password. Hi Jeroen, thanks for using WinSSHTerm! By switching from version 1.10.1 to 1.11.2 the password file "config\key" will be transformed to a new format. If you use this transformed password filee back in 1.10.1, and then try to upgrade again to 1.11.2, it won't work. I think this is the problem you've run into. You would need to restore the files "connections.xml" and "key" from version 1.10.1 and then do the upgrade again. Thank you for the answer. Tried lastest version (portable) and all works good now. Great program, has everything i need for connecting to a Linux environment. Just tried to upgrade the installer edition from 1.10.1 to 1.11.2, and it worked as expected (of course I had to manually delete the password file "config\key", because it already had the new format and it's not possible to downgrade). So there should be no problem with the installer edition, too. Is there any way to insert several >Login Cmds in one session? And one more thing: are you planning to implement UI, independent to different resolutions? On high resolutions it is a little blurry (ver 1.11.4). Hi Gene, thanks for using WinSSHTerm! I don't have any experience how to deal with high resolutions yet. Could you please send me a screenshot via mail? Could you also tell me why you would need to have multiple Login Commands for one session? I have a feature request but I don't have idea how to solve it. It concerns output logging. I always use putty session WinSSHTerm and have enabled logs to "\MyDisk\Logs\PuTTY\&Y_&M_&H.log". This way I do not bother each time to remember to log something. But, sometimes I need to log to other file for some reason and currently there is no other way then modify WinSSHTerm putty session. I wonder how I could simply and fast change log file? you can overwrite your log file name from the PuTTY session "WinSSHTerm" by setting it in the connection configuration (Configuration->Session->Log file name). So if you temporarily want another log file name for a connection, just set the log file name there. If you delete it, it should fall back to the one you set in the PuTTY session. I've totally missed it! Thanks a lot! Would it be possible to add a sort function to the connections tree? Possibly on a per folder basis? I have about 100 different connections, all with similar names. Having to manually sort them around is becoming tedious. I would think others may feel the same. Hi Brian, thanks for your feedback. There is a workaround for this. I added point 10 in the FAQ section. This is a great tool, with integration to WinScp. Wonder if possible to make access to "copy file" even faster by pressing a hot key, while using arrow key to navigate the tree. Thanks, in version 1.12.2 it will be possible to open WinSCP by clicking on a connection with the middle mouse button. Thanks! Your release is fast and did enable the middle mouse click on tree node to launch WinScp. It would be awesome if you could integrate the "PuTTY Connection Manager" tab control system (Preview here : http://www.unixmantra.com/2013/04/putty-connection-manager-tabbed-putty.html) to easely display many terminal without using the cluster mode. I'm quite happy with the way it works now - almost all of the time I don't need to look at more than 2 or 3 PuTTY sessions simultaneously. Drag&Drop would be nice, but I don't need to move the PuTTY sessions around that often. @Mathod, or just to add option to open saved sessions not in "tabs", but in "windows" (5th session then will start in 2nd tab of 4th window, for example). (3) Launch WinScp from the current putty session path. i.e. kind of like pipe the "pwd" result into clipboard and then launch WinScp to that path. 1. Could you implement the possibility of vertical organization of windows - for 16:9 or even 21:9 displays. 2. Limitation of 4 windows often is not enough. 3. Possibility to open connections in windows, not tabs, or with shortcuts (for example: ctrl+left_click on connection opens it in a window). Thank you kindly for your work! I really like your SSH client and I love that you're still working actively on it. One feature I would really like to see is the ability to have a shortcut bar. Here I would be able to define buttons (name of button & command) and when you click the button it executes that command(s) on the active SSH session. This could be very nice to run often used commands quickly. I'm using the abandoned mtputty from 2012. This is a very promising piece of software (i donated $10). In the PuTTy, there is an option "restart", can you also add this option in winSSHterm too? Thanks, could you please give some more information? Happy I found you, had to move from linux to Windows, and was starting to miss some of my old ssh management tools. - instead of closing pageant on close, can we "delete all keys" on close? (forcing pageant close leaves the tray icon. After opening and closing winsshterm a couple of times, the tray gets pretty full (a hover over the pageant icon makes them disapear, but still)). - Have multiple "groups" for the multi-input. If I could assign a group to certain windows and another group to other windows to quickly switch between groups instead of having to clear all and select multiple machines everytime. Unfortunately it's not possible to delete keys from Pageant or closing it properly without using its GUI. These features have already been requested - see https://stackoverflow.com/questions/26801589/remove-a-key-from-pageant-using-the-pageant-command-line. As a work around for the many Pageant icons in the tray area you could choose "Launch only" under Preferences->Pageant. This way WinSSHTerm won't kill Pageant. I think the Multi-Input feature is not suitable for doing automation tasks. I'm currently working on a new feature, which will be more suitable for this (with the help of plink). It will allow you to send scripts to defined groups without the need to open up a GUI for every session. But it will be a v2-only feature. I've previously have used color themes to emphasize shell being a product server versus some other. Are there other methods for this in WinSSHTerm? Thanks for your interest in WinSSHTerm. Currently this is not possible. I'm planning to implement a feature where you can define custom color schemes, which can be assigned to all or individual connections. I've been using WinSSHTerm since a while, i'm really used to it. Thanks for the developement ! Is there any way to execute a script we have on our computer, like Kitty allows it with the option "send script file" ? I am using often Alt+Tab shortcut to switch between windows. Unfortunately WinSSHTerm does not work very well with this shortcut. For example when I open new terminal and press Alt+Tab then it does not switch to another window. The same happens when I click on another tab in WinSSHTerm and then press Alt+Tab. thanks for your feedback. I think I don't quite understand you - do you want to switch between different tabs inside WinSSHTerm or do you want to switch between different programs like between WinSSHTerm and your browser? Switching between tabs with shortcuts (like e.g. ALT-GR+SPACE or CTRL-9/0) should work perfectly as expected. If you want to switch between different programs with ALT-Tab might not always work as expected. This is due to the fact WinSSHTerm wraps the PuTTY/KiTTY window, which makes things unfortunately very complicated. However, I think the current implementation works quite well. At the moment, I'm using WinSSHTerm Windows 7, and I can ALT-Tab to other programs like expected. But I know that under Windows 10, you have to press ALT-Tab twice to move outside WinSSHTerm and then press ALT-Tab once to move back to it. So besides the known issue on Windows 10, ALT-Tab should work without problems. If ALT-Tab or any other shortcut doesn't work on your system I'd be thankful if you could use the contact form so I can mail you back and we can analyze the problem. I switched to Winsshterm (v2.1.3) from puttycm when I upgraded to Windows 10 a week ago, and I love it. Thanks so much for such a useful product. I've had a few instances of "WinSSHTerm has stopped running" popups from Windows after it's been up for a while. No particular pattern or reason I can see. In most cases I was using it at the time. Nothing complicated, just 3-4 putty sessions open. Have you seen anything like this, or is there anything I could collect to help figure this out? thanks for your feedback. It would be great if you could use the contact form, so I can email you back and we can analyze the problem. Hi, the same thing happens to me but with version 1.12.11, any solution? Could you please tell me which version of Windows 10 you are using? Also, do you have mutliple instances of WinSSHTerm running when the crash occurs? You can contact me directly via mail: info - at - winsshterm.net. Thanks! OK, thanks!!! i did not see the changes for v2 versions. I would like to help you with a translation. Could you please provide us with that possibility? Thanks, currently there are no plans to support multiple languages. I’ll give the diagnostic tool a try when I get back to work next week. It doesn’t happen too often but maybe we’ll get lucky. 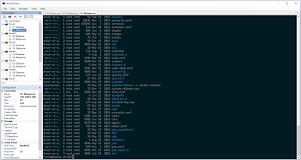 I’m only running one instance of WinSSHTerm, with an average of 3-5 putty sessions open when it happens. I looked through the code and found a (small) memory leak. In a test environment with very low memory I could see the app crashing. In version 2.1.4 this should be fixed. I would be glad if you could see if this version works for you. Thanks! I'm sorry, of course it's Larry and not Frank! Just wanted to let you I found another bug, which could cause an app crash when closing multiple instances of WinSSHTerm at the same time. This was fixed in version 2.1.5. Hi Patrick, I was only running a single instance, but in case something fixed it in 2.1.4 or 2.1.5, I'll upgrade to 2.1.5 and see what happens. It's been crashing once or twice a day, so I'll give it a couple of days. If it crashes again, I'll download the Windows tool and run it under that. I'll keep you posted. Thanks again for a great program! Hi Larry, that would be great. Thanks for testing and for your feedback. Not a single crash in many days since installing 2.1.5 (down from 1 to 2 crashes a day). I'd say 2.1.5 fixed it. Thanks! I'm new to WinSSHTerm--really like it. Thanks! But I cannot get paste to work, with either the middle button or right button option selected in Preferences/Copy&Paste. Shift/Insert does work (but that's not very convenient). Any thoughts? Thanks, pasting with middle/right mouse button should work as expected... Are you able to paste if you open a session directly in PuTTY? Fortunately, the next version of PuTTY (probably 0.71) will enable copy and paste operations through a context menu, which is much more convenient. I'm currently trying to implement this feature in WinSSHTerm. 1.) Provide an option to set hotkeys for changing to specific tabs. For example, ALT+1 to go to tab 1, ALT+2 to go to tab 2, etc... I personally find ALT plus a number very easy to use with only my left hand. 2.) Middle click to close a tab - this would be very handy and is a shortcut I use in other tabbed programs (like Firefox and Chrome) so it's almost second nature. 3.) I frequently like to clear the terminal and clear scrollback to start a fresh and clean session. It would be great if there was a customizable hotkey to do so. In Putty you can right click on the menu icon to do so but in this program, you can't at all. Typing "clear" in a Unix SSH window does nothing. 4.) Using vi gives "Unknown terminal type" - other similar programs do the same. This makes vi harder to use. 5.) Often I find there is a lot of input lag when typing in a terminal. It's all my sessions and when I use plain Putty, the lag isn't there. I know this isn't a lot to go on, but if you want me to enable some verbose tracing, I can try to help pinpoint this. 6.) Minor UI issue - but what's the point of having a "Connections" entry in the Connections tree? It doesn't do anything and is not the header, just a sibling to everything not in a folder. Hi Matt, thanks for your feebdack! 1.) As WinSSHTerm only embeds PuTTY, implementing shortcuts is not an easy task. E.g. if I’d set the shortcuts ALT+NUMBER these shortcuts would also be sent to the PuTTY terminal which would eventually cause some unexpected action there. Also, what if there are more then 10 tabs open? 5.) I haven’t had this issue yet. Also, you are the first one who reported this. Can you make a screencast where I can see the lag? I'm using WinSSHterm with kitty_portable. All works but session logging is not. I set "Printable output" and full path to file in &H-&Y-&M-&D.log format. thanks for your feedback, you’re right, logging is not implemented for KiTTY yet, because the way the log path is stored in KiTTY is different to how it’s done in PuTTY. I haven’t found a solution yet. would it be possible to implement the opening and saving a session from command line ? Allowing single instance of winsshterm, because i want to open the putty session from script. I'm thinking about creating a python script which would accept parameters similar to your example and then generate a connections.xml. This would be useful for the initial creation of the connections tree. Why would you want to open sessions from script? I have to take the account from a web repository and then with my java tool automatically opens the connection using putty. It would be nice to do it with winssh too. I could even change the .xml file adding the new session and reloading winsshterm, but I do not know the encryption key used by algorithm to encrypt password in the xml file. I'll try to add a quick connect feature to WinSSHTerm. If I manage to do this, then I think I could add a possibility to launch a SSH session from command line with given parameters. would it be possible to implement new shortcut for Duplicate Session ? You can open the current session in a new terminal by opening the search menu with CTRL+SHIFT+9 and then pressing CTRL+ENTER. You can also select a different window by pressing TAB and loop through the windows radio buttons with SPACE in the search menu. Question: Is it possible to extend the search function towards some kind of filtering? PS: You can take a look at what I mean within SuperPuTTY. thanks for your feedback. You can use the search dialog (Navigate->Search) which supports this kind of search. However, folder names are ignored by the search. I'll have a look at the tool you mentioned and see what I can do. How can I change the config folder path? this is currently not possible. Could you tell me why you would like to change it?